A broken laptop screen can be a source of great frustration. However, contrary to popular belief, laptop screen replacement requires very little technical expertise. 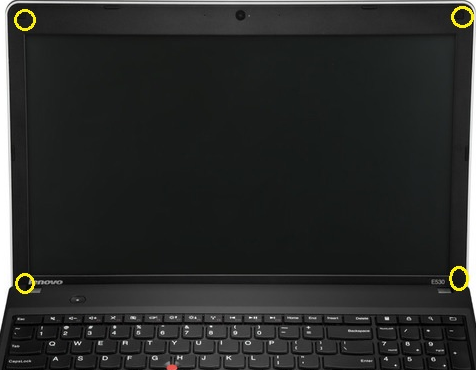 Below, you'll find easy to follow, step by step instructions that will help guide you through the Lenovo E530 screen replacement process. Unplug your laptop from the mains power and remove the battery. You should also make sure that you have disconnected all peripheral devices, (such as memory sticks and/or drives.) Once you've done that, use a flat edged implement, (such as a razor or a debit card,) to prise off the aesthetic covers, (located in each corner of the front bezel,) used to hide the screws underneath. Once you have removed the aesthetic covers, remove each of the screws underneath and, set them aside safely. Next, use a flat edged implement or your fingers to gently, (but firmly,) prise the front bezel away from the rest of the screen casing. Note: take care when removing the bezel as it is rather brittle. Remember too, that the front bezel is attached using a number of plastic clips which you'll need to unhook. Work your way around each side of the bezel until you have loosened it sufficiently. You should then be able to remove the front bezel from the laptop. Carefully pull the broken screen towards you, proceeding to remove the screws attached to either side. Next, take hold of the top of the display, proceeding to lay it, face down, on the laptop keyboard. 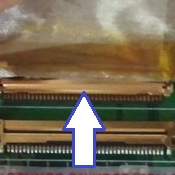 On the back of the screen you should see a thick cable attached to a gold connector. Disconnect this cable. Remove the broken Lenovo E530 screen from your laptop. To replace the damaged display with a newly bought replacement, all you need to do is complete the above instructions in reverse. It's really that simple!